These rainbow glass sphere stands are just the thing you need to securely hold and display your spheres. Gemstone spheres are some of my favorite magical tools, but it can be challenging to display them without a proper base. 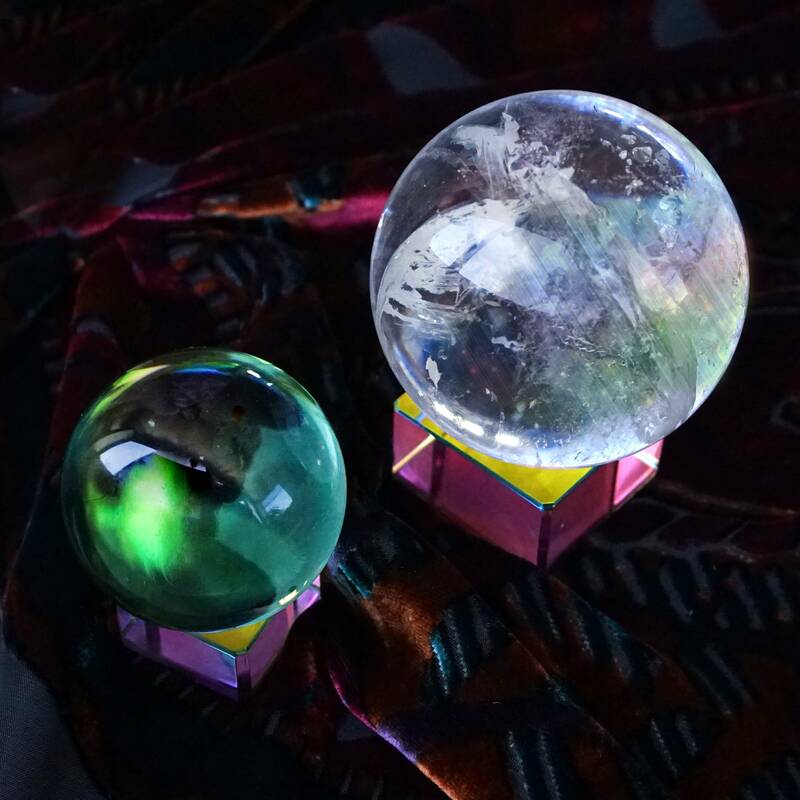 These glass sphere stands are lightweight, yet durable, and catch and scatter the light in a wonderful prism of rainbow colors. Any sphere would look gorgeous on one of these! Choose your size from the drop down menu. I have smaller stands that are 1 x 1”, and I have a larger stand that is 1.5 x 1.5”. They have a felt bottom so as not to damage any tabletops or delicate altar surfaces. I know that these stands are going to hold your spheres beautifully and practically. I am very excited for you if you get one! I have a small and a large. The really fun thing with the large is having a smaller sphere on it and being able to spin it in the holder, lol. OK, these add a height if you want to stagger the height of your spheres, and the colors are just so pretty and set off the stones (well, certain ones), and they are absolutely sturdy and solid, so no fears of someone tipping over the sphere holder by accident. Really love mine, will probably get a couple more. FYI, I did try to put an egg in one, it just kinda slides down, so these are really for spheres, although I’m sure you could put a specimen stone on to show it off, too.